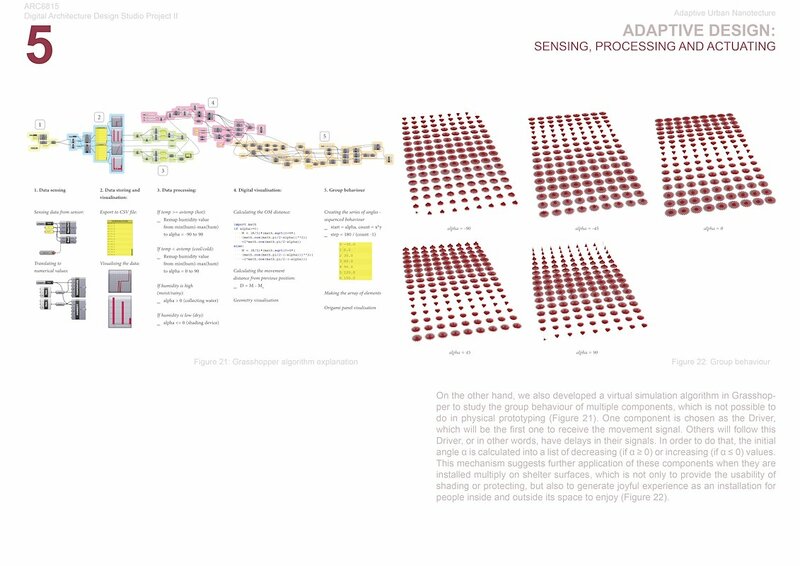 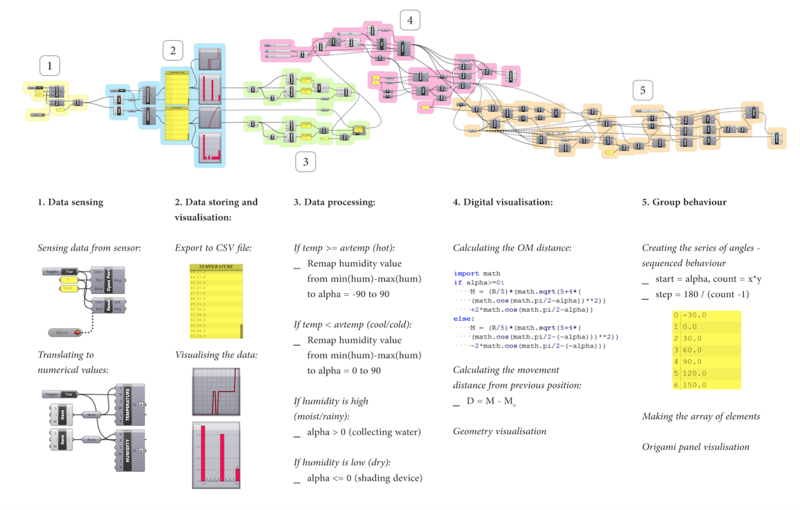 The design process of dynamic architecture has been an immerging topic in recent studies, in which researchers try to find an effective method of generating and controlling architectural adaptive components. 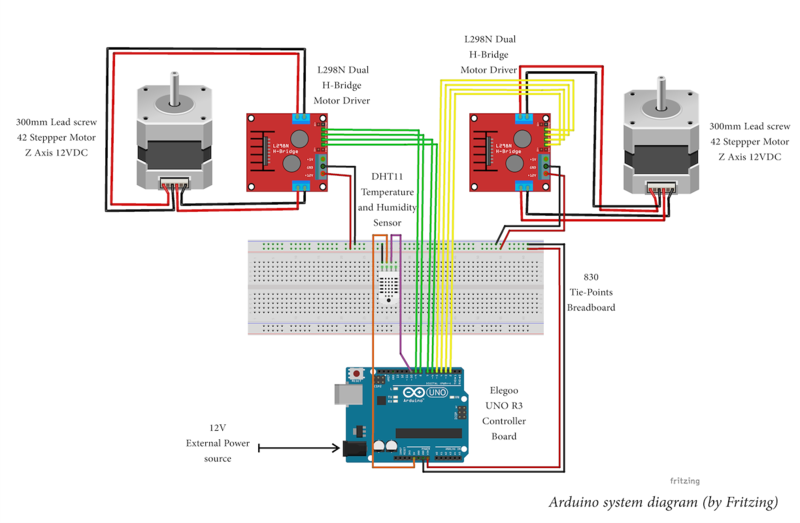 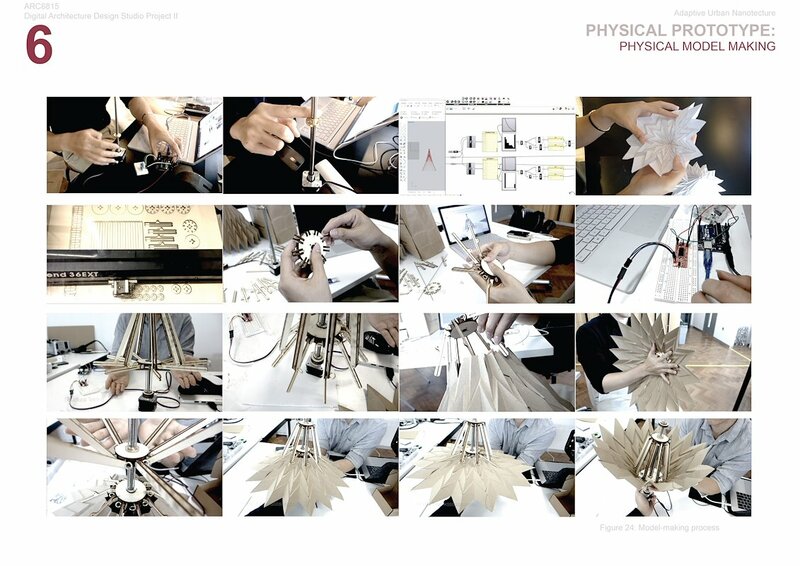 In this study, we propose a digital modelling process that sought to balance the architectural flexibility and adaptability in the design of a kinetic device. 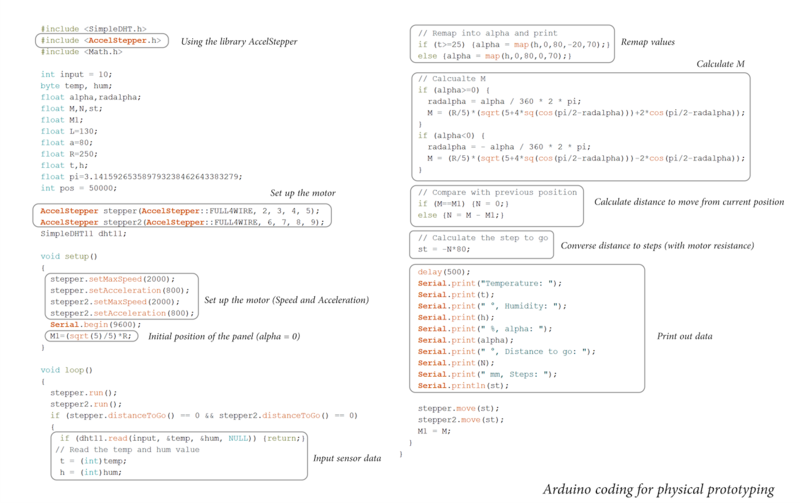 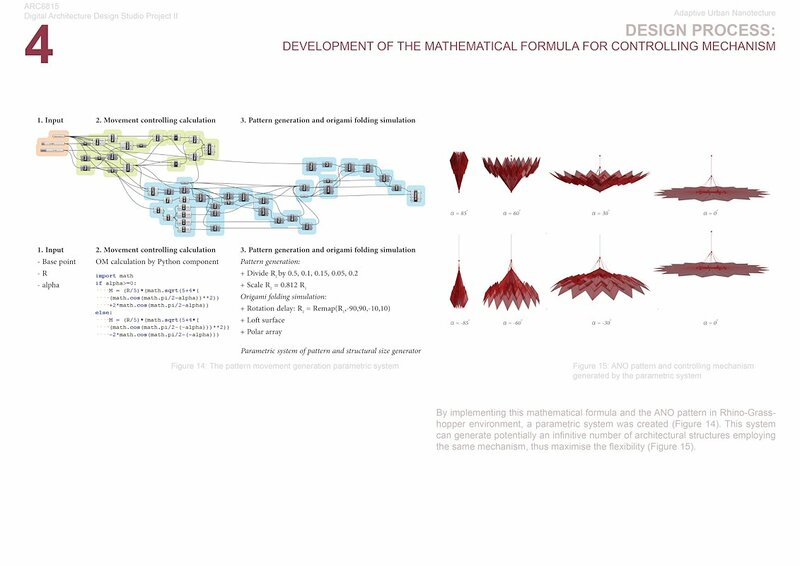 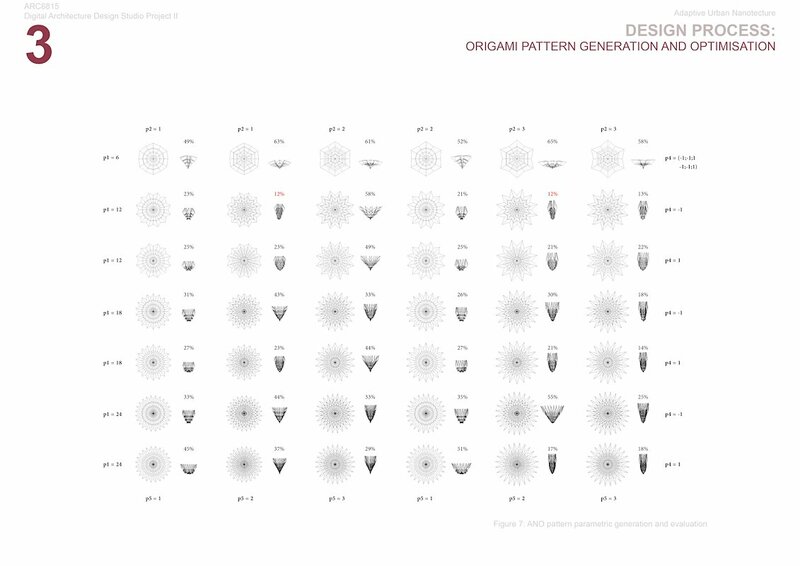 Inspired by the pinecone nastic movement, a flexible modular component is proposed and evaluated through various methods including origami-based fabrication simulation and mathematical parametric generation. 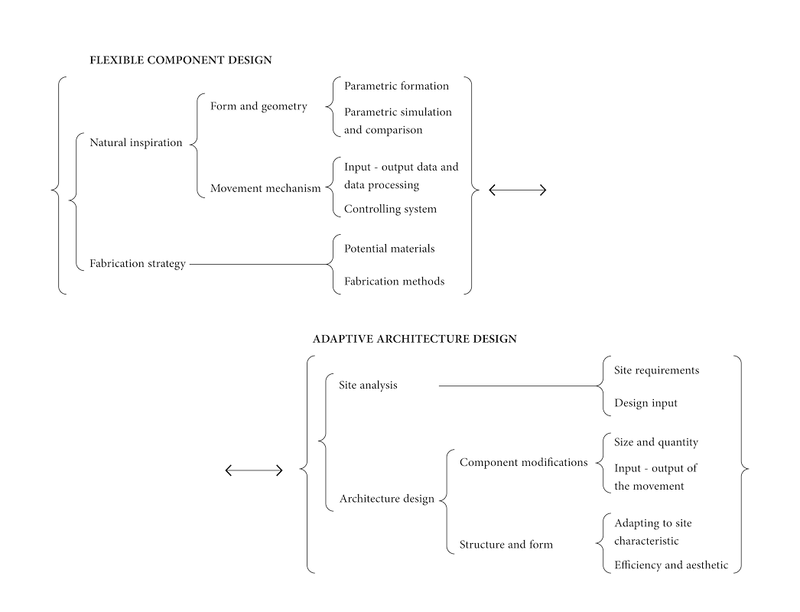 The modular design system is then applied to a specific chosen site with its environmental and contextual requirements. 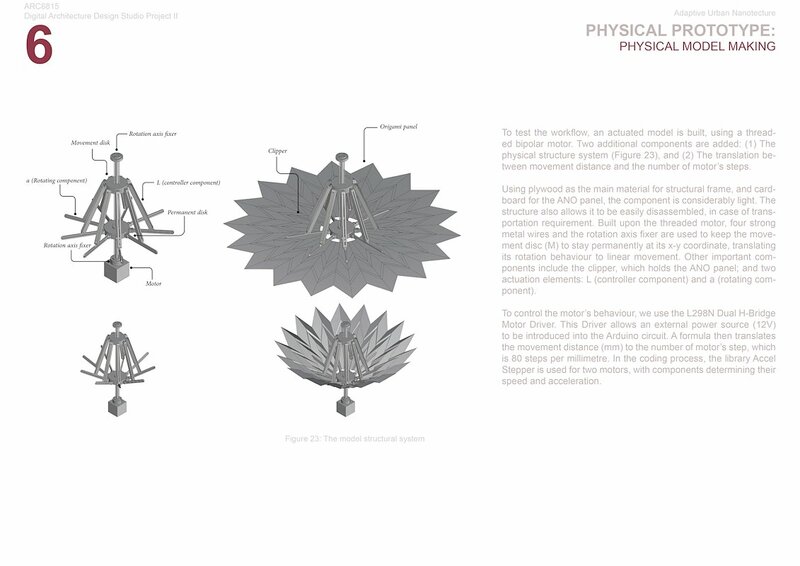 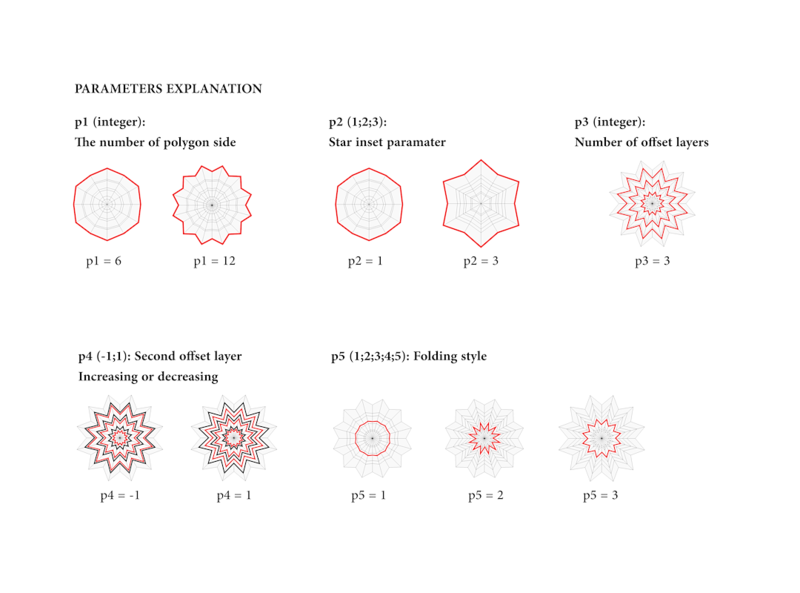 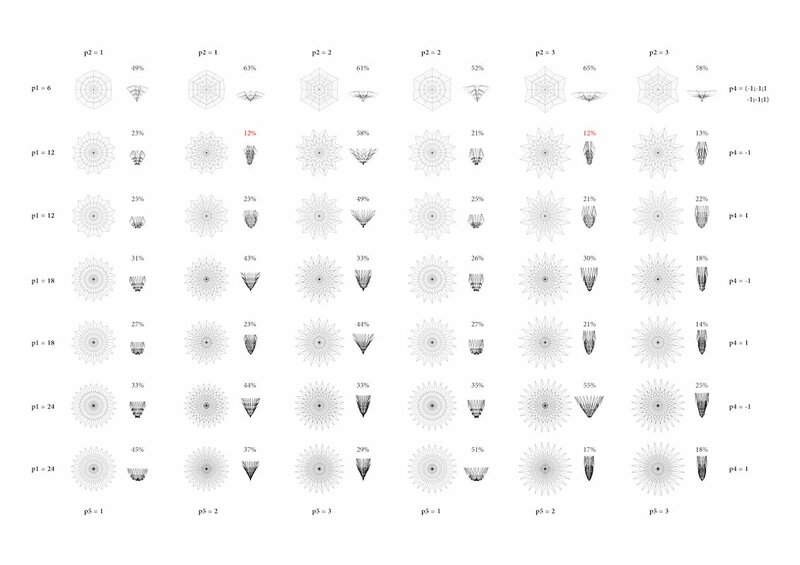 The results show how the pinecone-like nastic movement may be translated into design and fabrication of adaptive architecture. 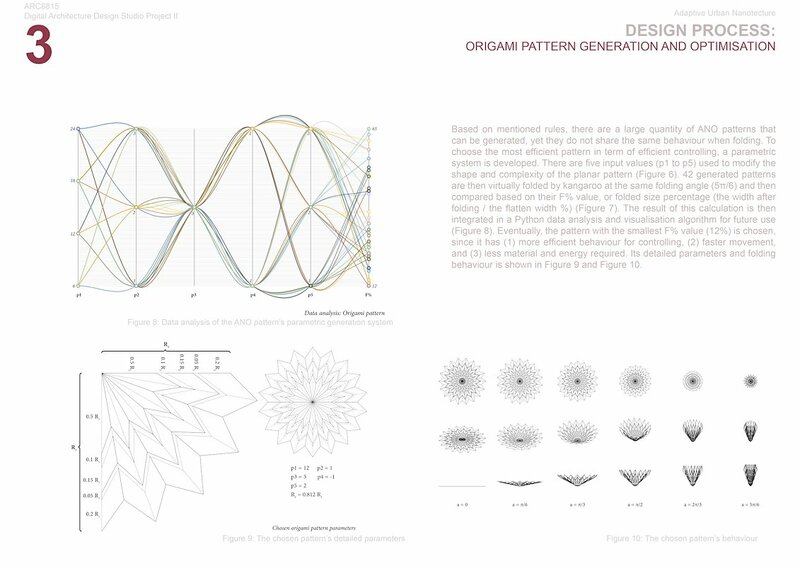 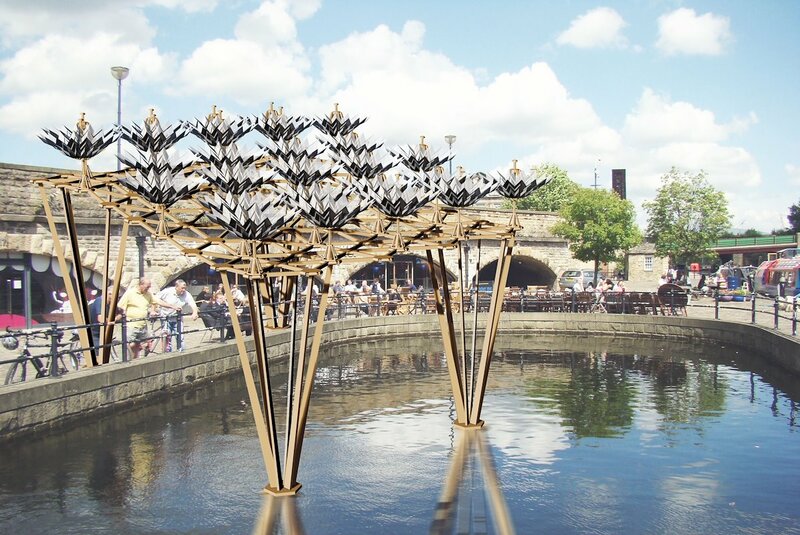 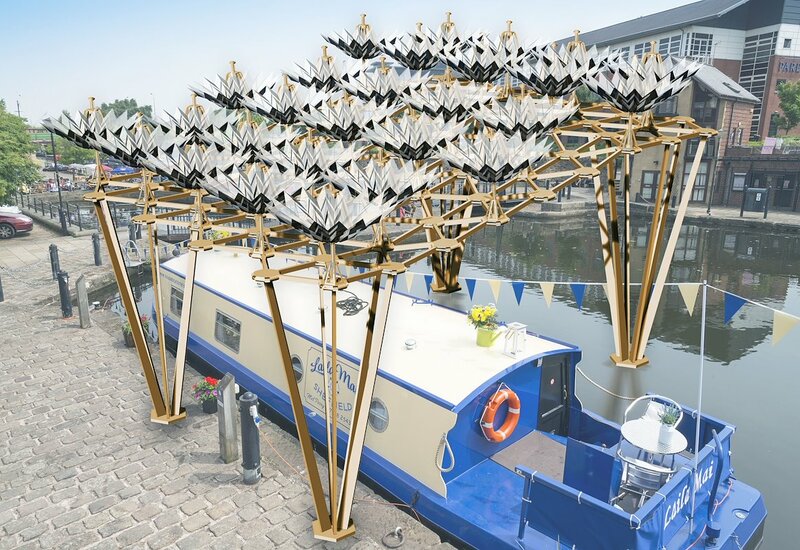 We discuss the effectiveness of origami pattern and mathematical formula calculation in the design process of kinetic architecture. 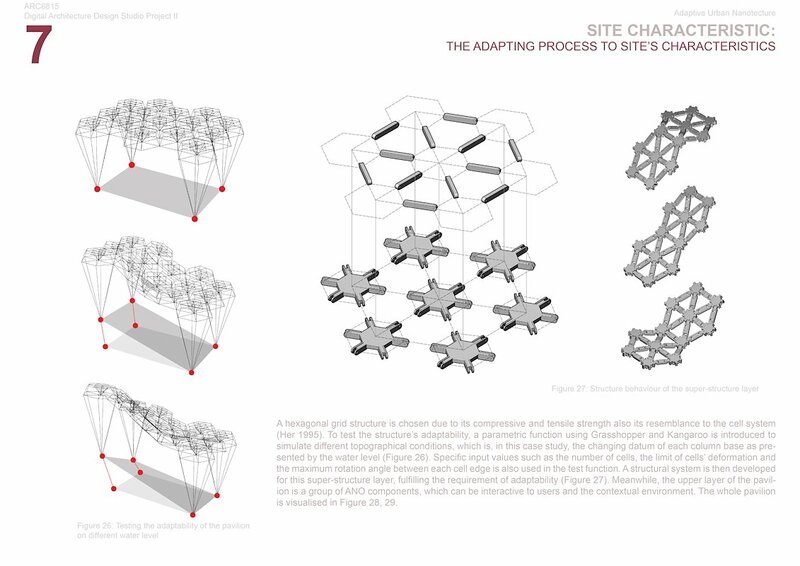 The development of digital applications has informed a new understanding of architecture design, in which building structures and building elements are no longer permanent, fixed or immobile (Schumacher, 2010). 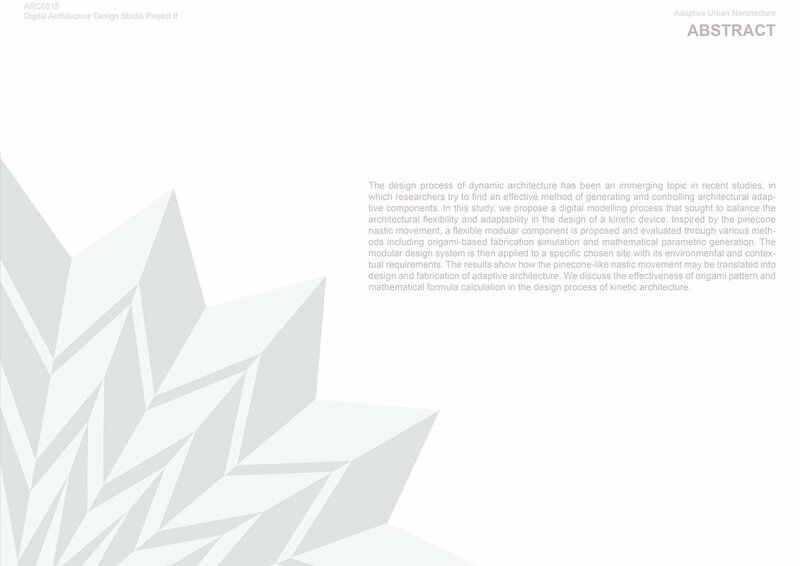 As dynamic architecture becomes more popular and applicable, there have been immerging questions about its purpose and effectivity. 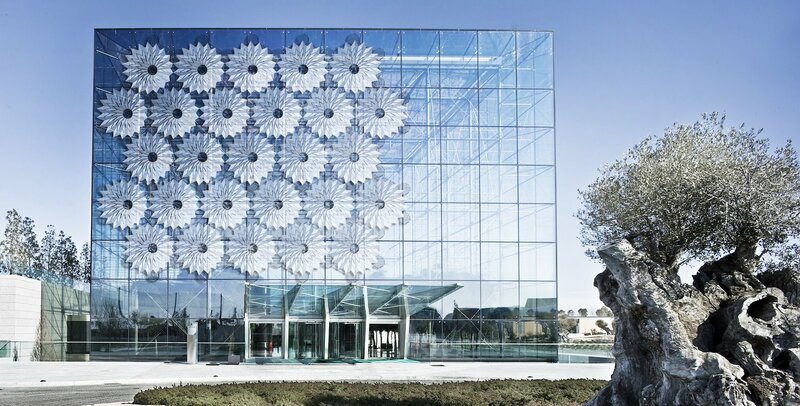 One of its typical employments is to respond to changing functional and environmental requirements. 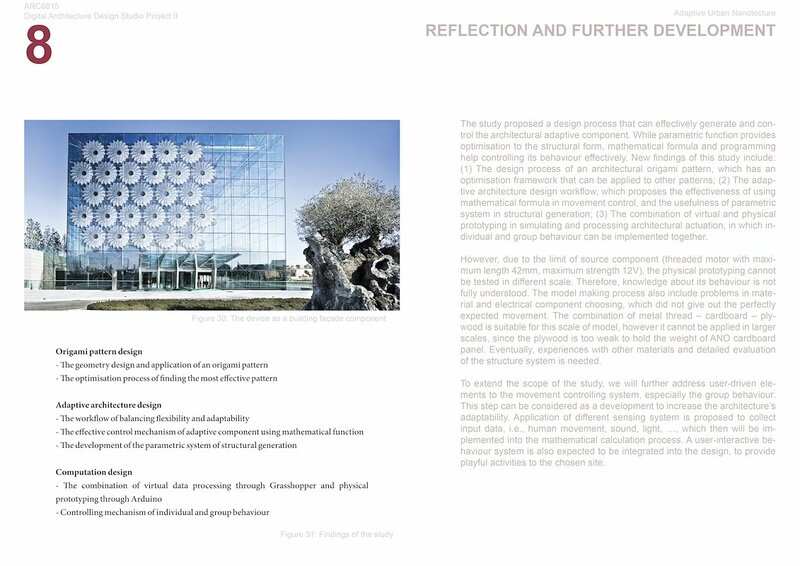 Although this viewpoint has potentials in creating more sustainable and fascinating architecture, it requires careful researches and suitable strategies during the design process, to achieve meaningful mobility and efficient controlling mechanism (Megahed, 2017). 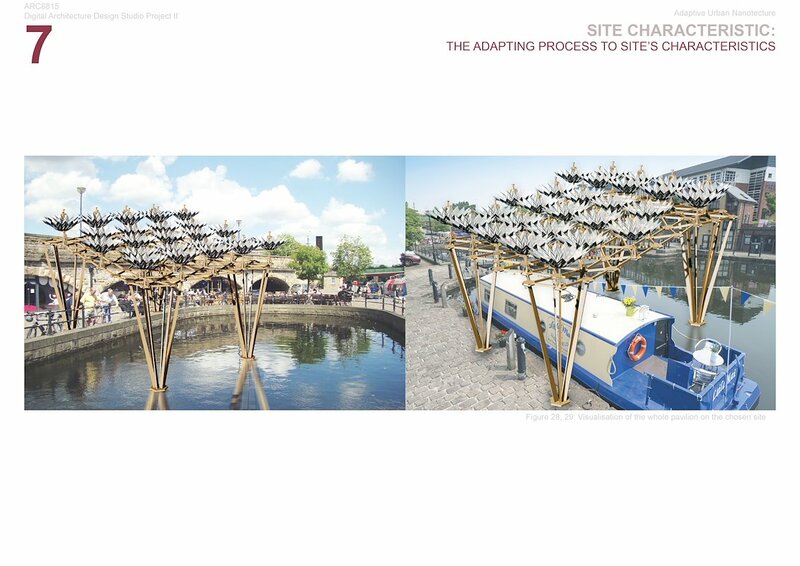 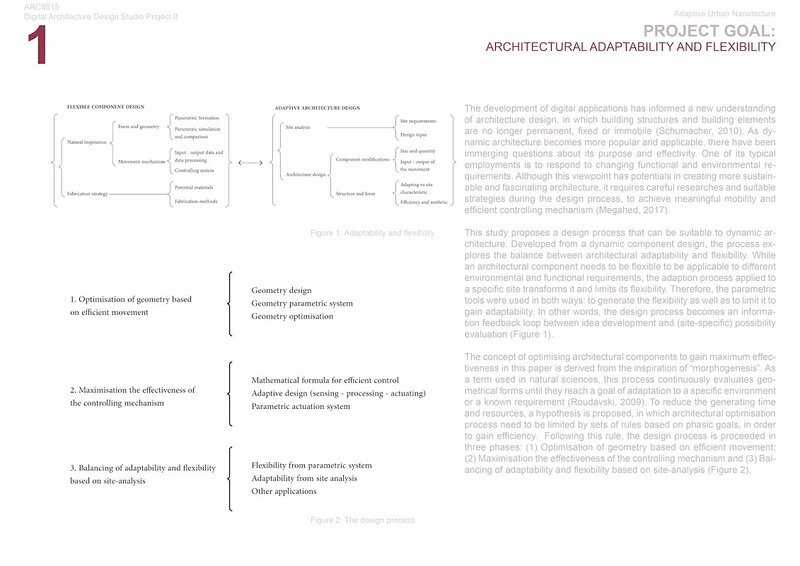 This study proposes a design process that can be suitable to dynamic architecture. 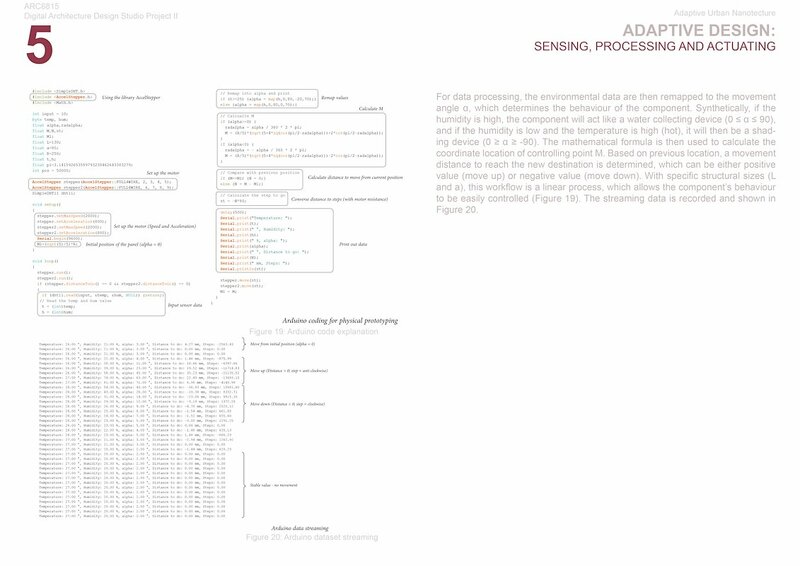 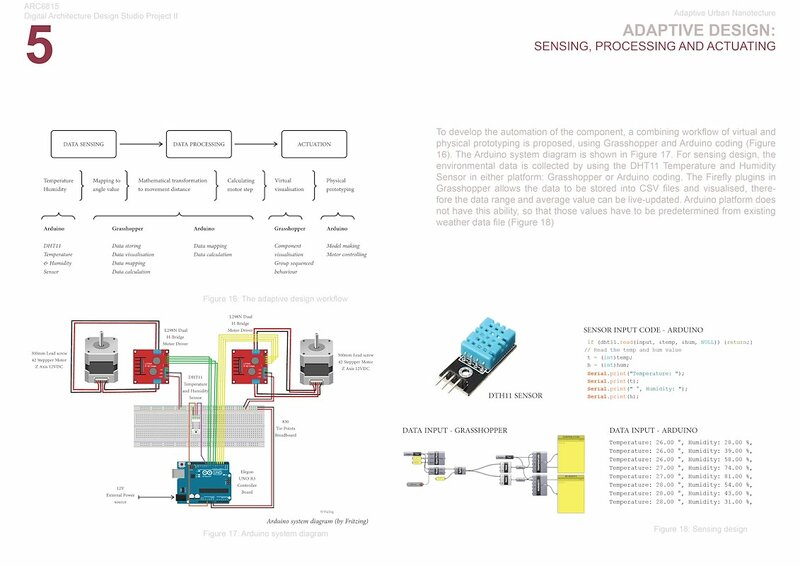 Developed from a dynamic component design, the process explores the balance between architectural adaptability and flexibility. 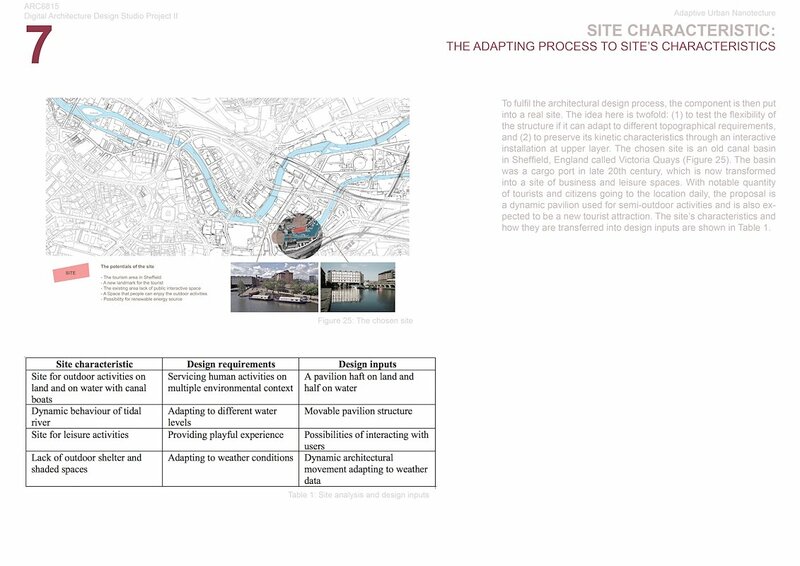 While an architectural component needs to be flexible to be applicable to different environmental and functional requirements, the adaption process applied to a specific site transforms it and limits its flexibility. 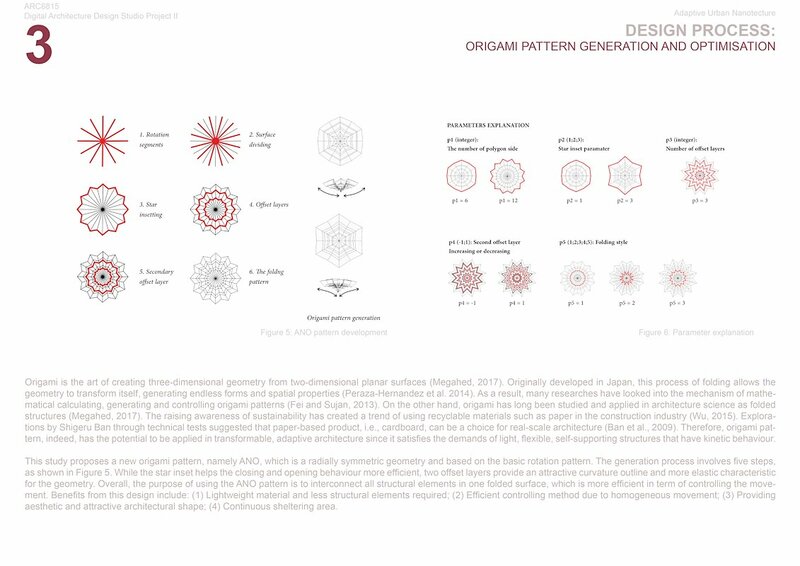 The concept of optimising architectural components to gain maximum effectiveness in this paper is derived from the inspiration of “morphogenesis”. 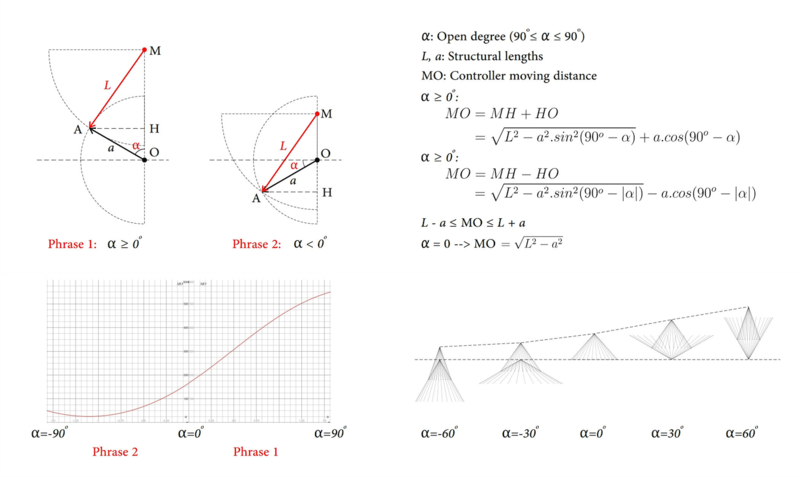 As a term used in natural sciences, this process continuously evaluates geometrical forms until they reach a goal of adaptation to a specific environment or a known requirement (Roudavski, 2009). 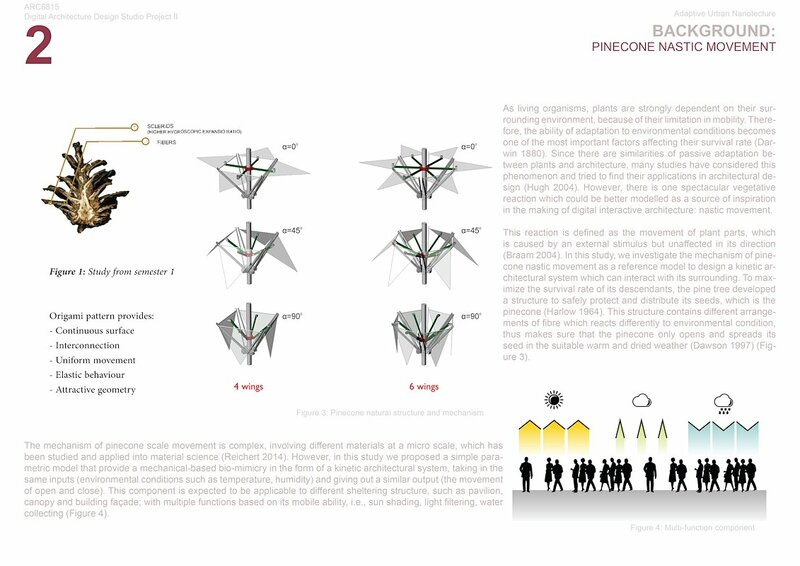 To reduce the generating time and resources, a hypothesis is proposed, in which architectural optimisation process need to be limited by sets of rules based on phasic goals, in order to gain efficiency. 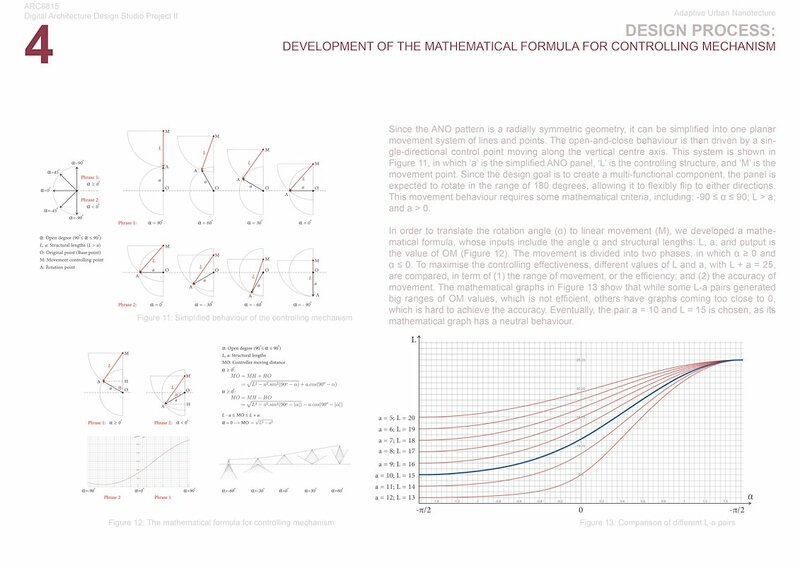 Following this rule, the design process is proceeded in three phases: (1) Optimisation of geometry based on efficient movement; (2) Maximisation the effectiveness of the controlling mechanism and (3) Balancing of adaptability and flexibility based on site-analysis.